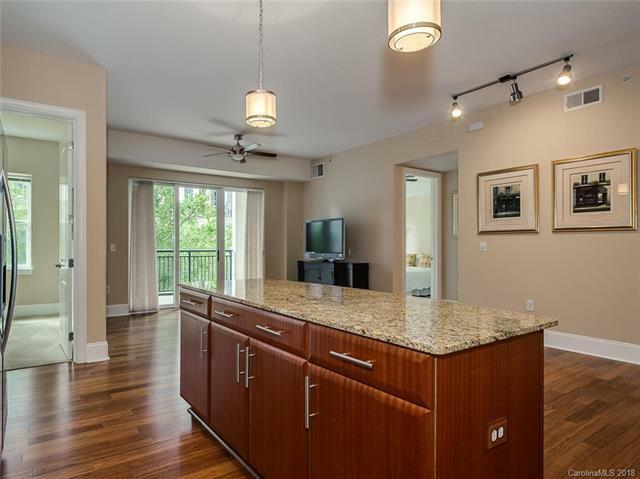 Wonderfully updated two-bedroom unit near the fountain at the heart of Piedmont Row. Living area has engineered bamboo flooring; bedrooms have new carpet. Walk-in closets and pantry have systems by Closets By Design. Lovely glass and travertine backsplash, updated pendant lights over the island and under-cabinet lights complement the granite counters and bamboo cabinets in the kitchen. Extremely rare large laundry room has custom upper cabinets and room for side-by-side full-sized washer/dryer. Cozy covered balcony is shaded by mature foliage; you feel as though you are in a tree house. This unit is truly move-in ready! Sold by Keller Williams At Baxter.